Treat it as a custom flag, which it appears to be. Reject the flag and complain that it has already been flagged as not an answer. Anyway, it's a bug, and it could be used to one's advantage (keep flagging until it is deleted), and it should be fixed. I'm not sure if it's a bug. the previous flags are dismissed and you're flagging it for some other reason, perhaps the post has been vandalized again. It's up to you to not flag it multiple times. And oh, don't be fooled thinking Mods don't notice this or others haven't tried this before. Frivolous flags are treated with disdain, and not only we decide to not take your flags seriously, the system will learn the same. Don't do it. Not the answer you're looking for? 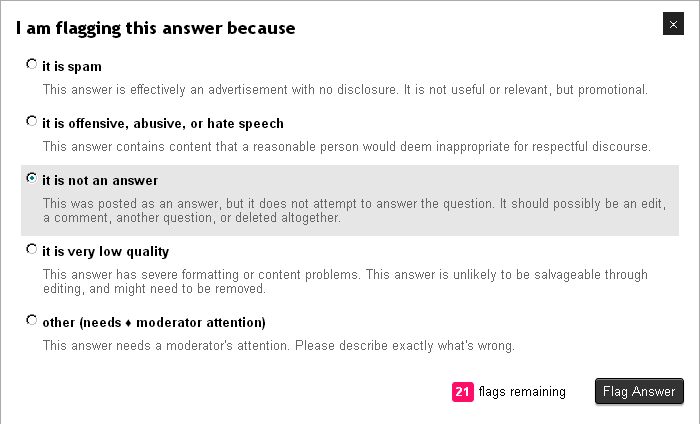 Browse other questions tagged bug status-completed flagging not-an-answer . Is there a way to block the recreation of the “bug” tag on the main site?